"Dazzled and Deceived is surely destined to become a classic. 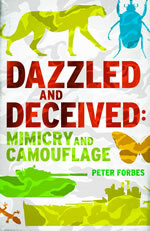 Peter Forbes has written a compelling and fascinating history of mimicry and camouflage; but, much more than that, he persuades us that mimicry is at the heart of the story of evolution. He has found an exciting and novel way of presenting this ever-intractable story, and raises important questions which the theory of evolution has hardly begun to answer." "It is a long time since I read a book that gave me so much enjoyment and told me so much both about the animal world and about human ingenuity. This is a wonderful story, engagingly told." "Forbes …sees with lovely clarity that nature, like art, is a bricoleur, a tinkerer, and that the thrill of it all is not in a stately grand design – as Darwin understood, there never has been any such thing, it's all expendable – but in life's multiple choices, chances and smallscale experiments: so many possibilities. " "This traffic in ideas, from biology through art to warfare, provides Peter Forbes's Dazzled and Deceived with an intriguing and fluent narrative. " "The natural armoury of deceptions as depicted in Dazzled and Deceived is astounding, and the history of research into the phenomenon is just as surprising . . . Forbes presents an authoritative account of research into mimicry and brings it bang up to date. " "This may well be the only book on evolution that we will ever review on this site, and it’s a good one … a fascinating story of scientific discovery and controversy, coming right up to the present day. Forbes does a very good job of explaining some very complicated theories, and has produced a classic work of popular science." "In this excellent and wide-ranging book, Forbes makes the hidden histories of science recognizable." " This enthusiastic study of “mimicry and camourflage” ranges between art, science and war to illuminate evolutionary wonders and the role of mimicry in human creativity." "...the fascinating story of mimicry and camouflage in science, art and the natural world, Peter Forbes’s scintillating book Dazzled and Deceived: Mimicry and Camouflage." "...as Forbes shows in his remarkable book (winner of the 2011 Warwick prize for writing), mimicry is not just “a fantastical tale of visual punning in nature”. He traces the study of camouflage and mimicry in nature from those 19th-century beginnings to contemporary research. But he does not overlook the more general fascination with this non-verbal form of trickery. His account of 20th-century military camouflage, and of the unexpected role of Cubism, makes this a broad cultural history."